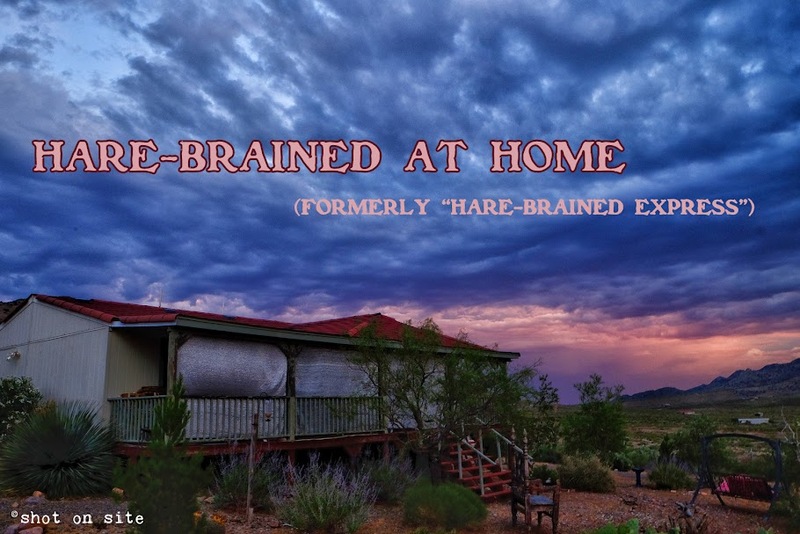 Hare-Brained at Home (formerly Hare-Brained Express Tour): Bucket List: Cooke's Peak. Check. Bucket List: Cooke's Peak. Check. Cooke's Peak is hard to miss. It peers over the mountains that line Interstate 25, 50 miles away. When you're driving north on Columbus Highway in Deming it appears much closer than it really is.. as if it's squatting right on the road in front of you. At 8408 feet, it's the highest point in Luna County.. more than a thousand feet higher than the Florida Mountains. Part of the attraction is the peak itself, which appears (and mostly is) a solid mass of exposed rock. I've wanted to stand on Cooke's Peak before we even lived here. We began hunting in it's massive shadow when we were just February visitors in an RV. The more I read about the hike up, the more I knew I wasn't going to attempt it alone. It took years to meet the right "guide". Enter Dave Shephard. Originally from somewhere in New England, and a fellow former full time RVer, he now lives in Deming, and is an avid hiker, climber, and explorer. He's also a fellow member of the Deming Photography Club. We shared a beer after a reception at the Deming Arts Council where the club had an exhibit in January. We hatched the plan at Mimbres Brew. At first we were going in February, then early March. Finally, Thursday, March 22 was firm. We met up outside of town, drove to the parking area, and did it. I should mention that, unlike other recent years, I hadn't done any kind of climbing this Winter. Most of my exercise involved walking the flats while hunting with the dogs. Make no mistake, this 9 hour adventure hurt me. I lagged behind going up and coming down, but by golly, I did it. the proof's in the slide show..
Bring on the next mountain!